The acquisition of Vivint Solar may not look so good for SunEdison these days. What: Vivint Solar's (NYSE:VSLR) sale to SunEdison (NASDAQOTH:SUNEQ) continues to look worse and worse every month as SunEdison's stock plummets lower and lower. Since the beginning of August, Vivint Solar's stock is down 15% due to a nearly 50% drop in SunEdison's shares, and it may be time to look for ways out of the deal. So what: When it was announced that SunEdison would buy Vivint Solar for $2.2 billion, it seemed like a great deal at the time. Vivint Solar shareholders would receive $9.89 per share in cash, $3.31 per share in SunEdison stock, and $3.30 per share in SunEdison convertible notes. But when the deal was announced, SunEdison's stock closed at $31.66 per share, and last week it closed at $11.99 per share. The convertible notes, which convert at $27.51 per share at best, are essentially just low-interest bonds at this point, and even if Vivint Solar shareholders get 0.12 shares of SunEdison stock per share (as is likely), that would only be worth $1.44 per share. Now what: There's not a lot more potential downside in Vivint Solar's shares if you assume that the sale is going to close, but now it may be best for both Vivint Solar and SunEdison to walk away. Vivint Solar is likely worth more on its own, and SunEdison can't pay for the cash portion of the acquisition without more debt it doesn't need. A breakup is just speculation at this point, but it's really the best possibility for upside at this point. SunEdison is in dire need of cash, and a low stock price isn't helping its cause. 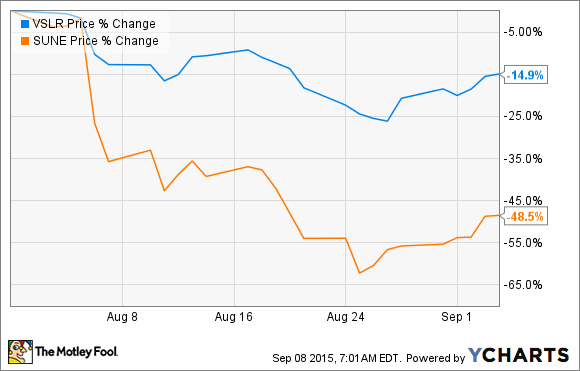 While the acquisition is on, I would avoid both Vivint Solar and SunEdison stock.